These short sayings and quotations are perfect for Instagram, Tumblr and Pinterest posts! 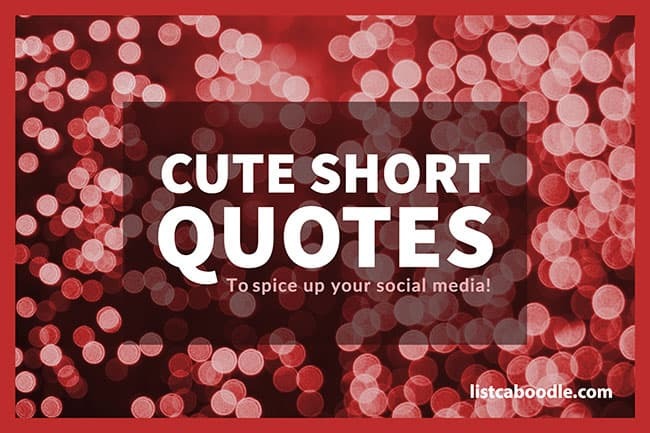 Need to find a cute short quote to caption your awesome Instagram post? Check out this list for the quotation or saying that best captures your idea. Bring your photos and videos to life with the perfect quote. Don’t be caught at a loss for words—let these sayings do the work for you! Often times, the most profound thought can be expressed in the fewest words. Here are some great examples you can use in your social media postings. A good family is priceless. Smile! It makes people wonder what you are up to. Life is not a strategy. If it weren’t for the mistakes I’ve made, I wouldn’t be where I am today. Life is a vending machine. The more you smile, the more candies you get from it. Love of a family is life’s greatest blessing. Stay foolish to stay sane. Life loves to be taken by the lapel and told: I am with you kid. Let’s go. The two most important days in your life are the day you are born and they day you find out why. You’ve gotta know what death is to know life. Character like a photograph, it develops in darkness. Do crabs think we walk sideways? Innocence is courage and clarity both. Flowers only last so long. Fate doesn’t care about plans. You are not my love…You are my life. Check out more short love quotations and sayings. Life takes you to places, love brings you home. Love… One small word, but with one hell of a magic. Together is the nicest place to be. Love is the thread that ties us all together. Ah me! love cannot be cured by herbs. Smile at the world, and she’ll smile back. Roses are red, violets are blue. I’ll never love anyone like I love you. You’re the jelly to my peanut butter. You’re like a dictionary. You add meaning to my life. If I had a star for every time you brightened my day…I’d be holding the galaxy in my hands. Success is your only choice. Little by little, day by day, what is meant for you WILL find its way. When it rains look for rainbows—when it’s dark look for stars. Keep going even when life is tough. Useful tip: Select one of these cute short quotes to use as a sign-off to e-mail messages. You are amazing. As you are. Stronger than you know. More beautiful than you think. A beautiful girl is nothing if she has an ugly heart. Emotions are just visitors, let them come and go. Don’t cry for a guy because girls give and forgive, and guys get and forget. This day was a total waste of make-up. The poorest man is he whose only wealth is money. You’ve been reading Short Cute Quotes.